Sometimes when you want to look your best, your makeup products can go wrong. It often happens with your mascara. When you are getting ready for an important meeting or going on a date, your mascara happens to ruin your entire makeup. If you have faced such a situation, read on and you will know how to fix it if ever you face the same situation again. Here is how you can fix a mascara situation that has gone bad. First of all, do not fret. Relax and calm down. You can fix it to perfection. You can avoid clumpy lashes and fix them easily. Usually clumpy lashes are a result of using old and unused mascara. This gives you a caked up clumpy look. It can even cause irritation in your eyes. So, the most important thing to keep in mind is to use mascara that is fresh and new. This helps in giving you perfect looking lashes. Try to buy a mascara that is long lasting, waterproof and smudge free. Take care to buy mascara that has a mascara applicator with bristles that have plenty of space between them. When you use such a bristle, it goes in between each and every lash. So, each lash is covered well, giving you a fuller and natural look. Do not choose mascara wand with too many plush bristles. This can give you a clumped look when you apply it on your lashes. Before you apply the mascara on your eyelashes, you have to check and see whether your applicator contains excess liquid on it. If there is excess liquid on your applicator, it can stick on to your lashes and cause a mess. So, make sure that you remove the excess liquid from the applicator and then apply on your lashes. This way you can coat your lashes beautifully and look gorgeous. After taking the required amount of mascara on the applicator, brush your lashes starting from the root and then go up to the tips of your lashes. You can wiggle the wand gently from side to side as you apply it. This is because working through your lashes in a slightly zigzag way helps in getting rid of the clumps. This trick is particularly effective for lashes that are still a little wet. So, do the zigzag motion immediately after you have applied your mascara. This covers each lash properly and defines the lashes well without causing any clumps. Remember that it is the mascara that you apply on the roots of your eyelashes that gives the illusion of length rather than the mascara that you apply on the tips. Even after all this care, if your lashes still look clumped, it is better that you keep a makeup remover pads at home with you, so that you can use it whenever needed. It is important that you remove the traces of the messy mascara immediately and effectively before the mascara dries up. As soon as you notice that your mascara has gone wrong, do not waste time thinking what to do. Just take the makeup remover pad and wipe your lashes by holding the pad at sixty degree angle with your finger between your lids. This can remove all the excess mascara that might be there on your lashes, while leaving your eye shadow undisturbed. Next you can take a paper towel and pat dry your lashes gently. It is better to use a paper towel because using a tissue can make it stick to the lashes. Paper towel on the other hand will soak up any extra moisture. Coat your lashes again with mascara, using gentle but firm strokes. You can do the zigzag motion to get perfect looking lashes. 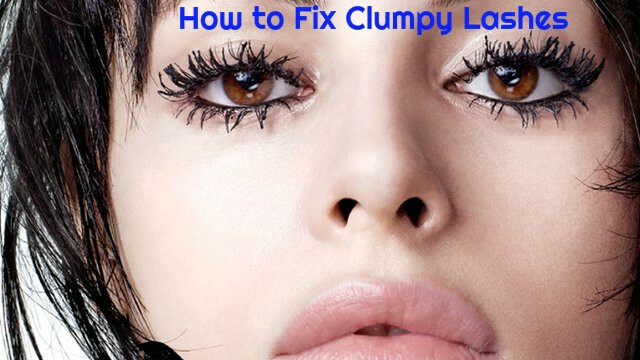 To remove the clumps, you have to close your eyes and place the mascara wand on top of your lashes, at the base. Then pull it through your lashes. Bend the brush of the mascara wand. This helps you to apply it easily on your lashes. You can even reach the tiny hairs near the inner corners of your eyes this way. Wipe the excess mascara on a tissue paper to prevent clumps. When you apply the mascara, try to keep your lashes curled longer by wiggling the mascara back and forth at the base of your eyelashes. Then you can move on to the tips. Coating the lash evenly can weigh down the tips of your lashes. Coat both sides of your lashes. This makes them appear thicker. To get thick lashes, hold the mascara brush at a horizontal angle. For a more natural look, you can turn it vertically. Before you apply mascara, you can soak your mascara bottle in a cup of hot water. This will make it thinner and liquidy instead of clumpy, so that you can apply it easily. When you apply mascara on your lower lashes, you should hold a spoon underneath your eye. This way you can prevent marks of mascara appearing on your sin. Dust some translucent baby powder over your eyelashes after you apply the first coat of mascara and before you apply the second coat. This is good for plumping up your lashes. If your mascara has become flaky, you can add a few drops of saline solution to your mascara tube to wet the formula. If you have touched your eyelid accidentally with the mascara wand, take a cotton swab and place its tip on the spot. Now spin it until the mark is gone. This way you can remove it effectively and prevent it from spreading all over.